There is another feather in Epic's cap, an honour, a milestone in the path of success. Successfully working in the field of financial services, Read More. the awards and honours achieved by Epic Research boost our enthusiasm, and build more credibility among the clients. India's one of the prestigious financial magazine Consultants Review published a list of "Top 25 Promising Financial Consulting Companies" in its recent edition which also includes Epic Research in it and a full page interview with CEO Mr. Mustafa Nadeem. 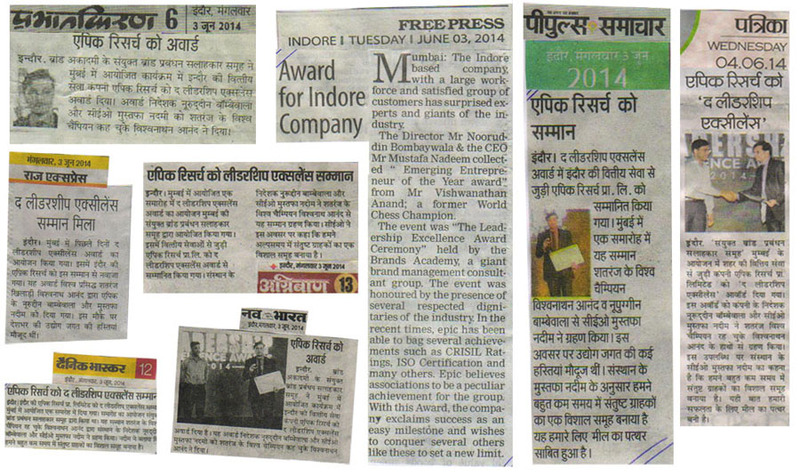 This is a special reason to feel glad on this achievement by Epic Research, Indore. 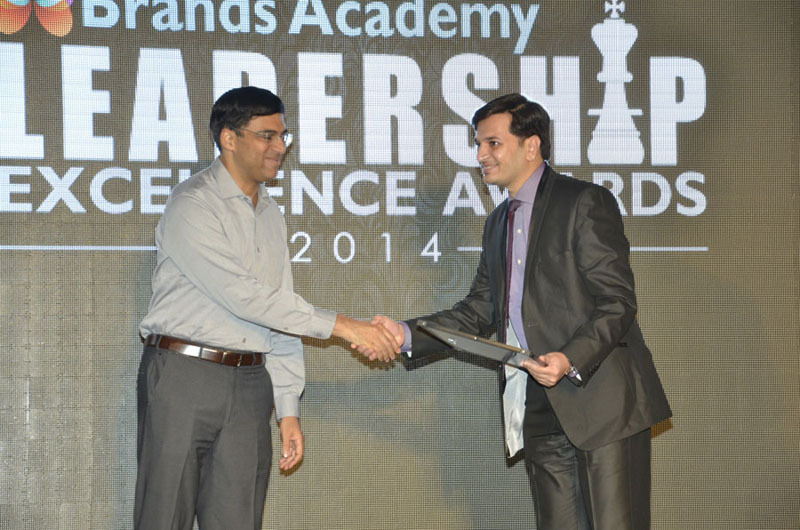 May 31, 2014 - Epic Research Bags the Brands Academy Business and Service Excellence Award. The Indore based company, with a large workforce and an satisfied group of customers has surprised experts and giants of the industry.Read More. Epic CEO Mr. Mustafa Nadeem collected "Emerging Entrepreneur of the Year award" from Mr. Vishwanathan Anand; a renowned Chess Athlete. The audience subjected the winners with huge glory and respect.The event was "The Leadership Excellence Award Ceremony" held by the Brands Academy, a giant brand management consultant group. The event was honored by the presence of several respected dignitaries of the industry. In the recent times, epic has been able to bag several achievements such as CRISIL Ratings, ISO Certification and many others. Epic believes associations to be an peculiar achievement for the group. With this Award, the company exclaims success as an easy milestone and wishes to conquer several others like these to set a new limit. The event will soon be broad-casted on UTV Bloomberg. 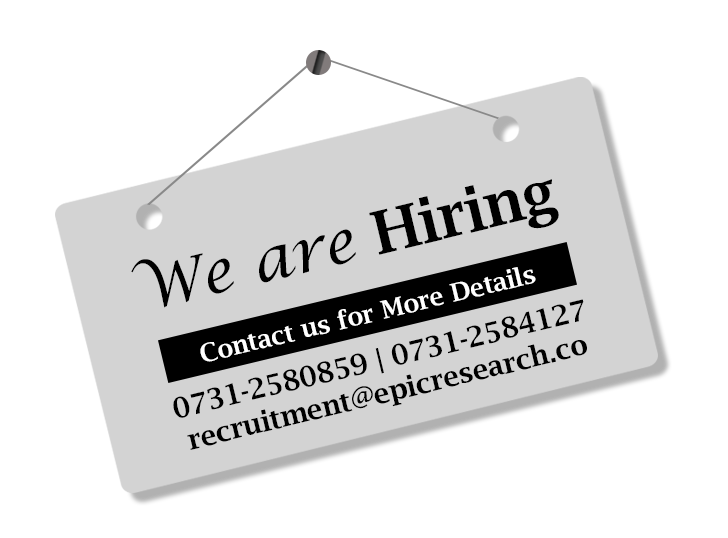 Dec 24, 2013 - Miscorost SAM audit conducted successfully at Epic Research As many of our customers know, Epic is a strong advocate of open source software and runs its servers and desktops with open source operating systems, Read More. 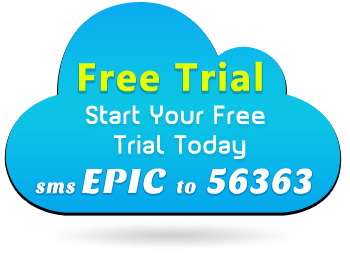 mail servers, collaboration tools, database servers, proxy servers, file servers, LDAP and application servers. In an effort to learn more about Epic, Microsoft asked HCL to audit the network at Epic Research. The audit successfully demonstrated that Epic does not use any kind of pirated software in its machines. HCL team gave a 100% clean certificate to Epic on completion of the extensive 4 hour audit. 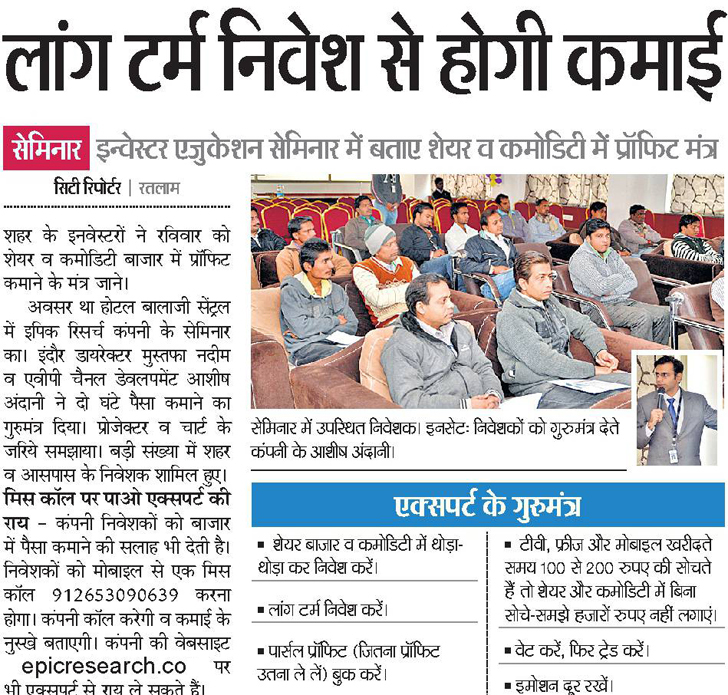 Epic Research is proud of the audit as noted by its Director and head of IT, Mr. Nooruddin Bombaywala in his quote "Most people assume that a modern company can not run on open source alone, especially in India, where software piracy rates are one of the highest globally. When Microsoft approached Epic, we assured that our systems are clean of pirated software. The successful audit by HCL reinforced our assurance and we encourage other companies to use and donate to the open-source community". 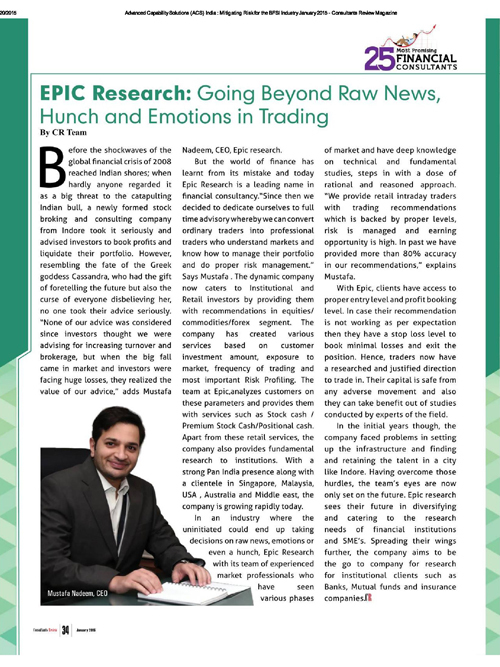 Oct 31, 2013 - Epic Research is launching its new website Epic Research is a well known name in the field of trading and investment advisories. Read More. We are a reputed name and help in changing lives by providing help and support to our customers. It is the trust and credibility which works behind the success of the organization. It is evident with a number of people who trusted on our services and tips with addition of new traders and investors day by day. This has positioned EPIC as a well established national brand in India. Epic Research has launched a new website to reinforce its values and position in the market as well as to offer a wider range of areas that the company offers its services in. Epic Research's new website would be available to its audience very soon (launching in the first week of November) with exclusive offers and packages which are not provided by other advisory companies in the market. As the director and head of IT of the company said about the website, "The new Epic site will feature unique services which were demanded by our customers and give them a source of rich information as well as an enhanced experience. Our efforts not only contribute to the growth of the company but also support Epic customers to earn good profits even in any kind of market scnario". 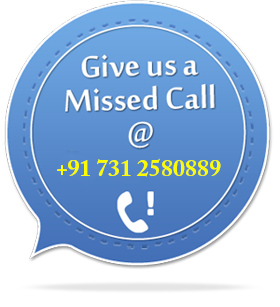 This website is the result of quality research and based on the requirements of the clients. It is the outcome of all the statistics and analysis done by the experts from the field of IT and financial services. It helps the Epic team to be more interactive with the users and become more responsive towards the queries of the site visitors. Quick problem solution, dedicated support, instant update intimation and full telephonic support are the key features of the new website. Sept 1, 2012 - Epic Research relocates to a new office in Indore India's leading financial advisory company Epic Research has leased a large space in Indore for relocating its head office. Read More. The space has been leased in the city center in a fully commercial and corporate building Atulya IT Park located on a prime portion of RNT Marg. The new space is believed to be upwards of 15000 Sq. Ft. and hasbeen furnished by Epic. The office will be home to more than 200 employees of Epic and is equipped with fully air conditioned world class work areas, meeting and training rooms and IT and telecom rooms. Mr. Mustafa Nadeem, a Director with Epic's board and the head of research and services was quoted stating "Epic is proud to move in to a truely corporate office fully furnished and customized for Epic. We have paid attention to even minor details like placement of coffee machines throughout the office and whiteboards in each cubicle when deisigning the work areas. We are confidant that the new place will increase the company's appeal as a great place to work and will result in higher productivity and staff retention."